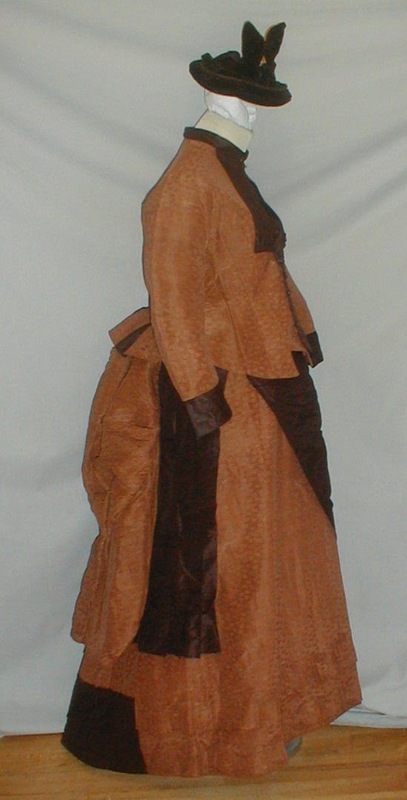 A striking 1870-1880 silk bustle dress and bonnet that was worn by Augusta Gold Morse Mosley of Vermont. The dress and bonnet were worn on her wedding day. The dress is made of printed copper silk and brown silk fabrics. The bodice has a front placket piece that buttons on both sides. The back center peplum is made of both fabric. The bodice is lined with cotton and has a front button closure. 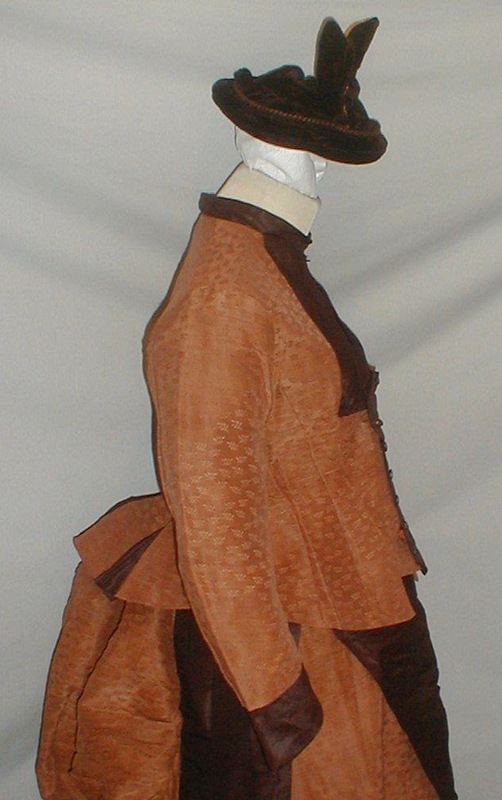 The skirt is designed with a brown silk apron front and brown silk pleating on the side. 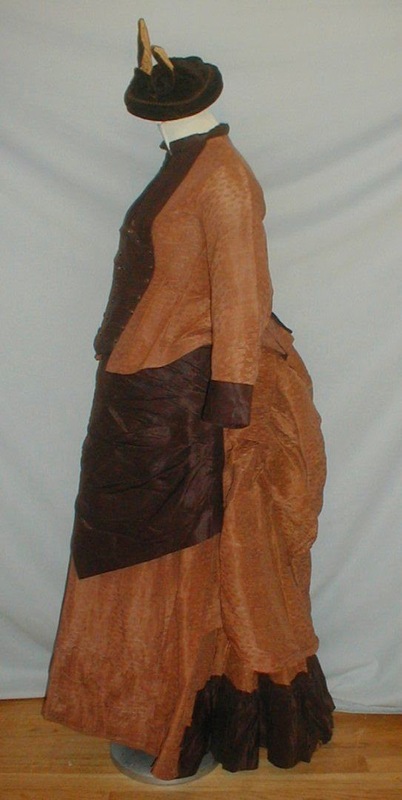 The skirt has a draped bustle back. The skirt is lined with cotton. 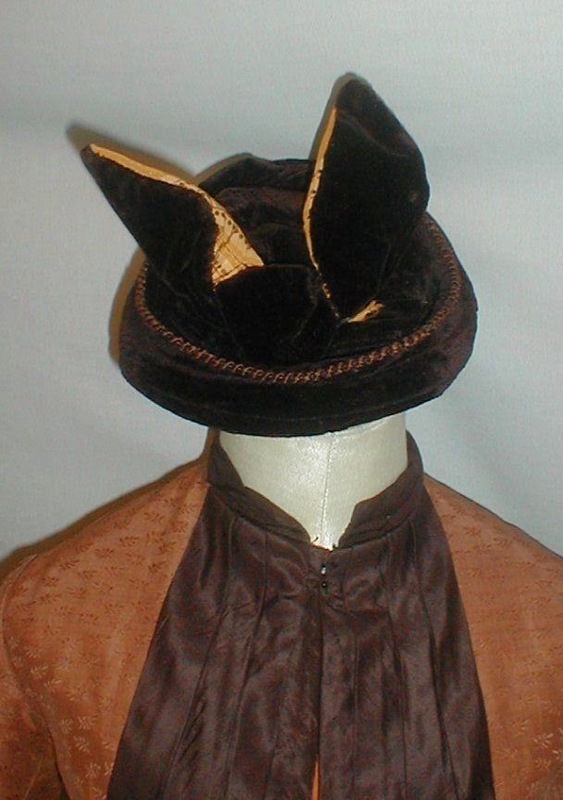 The bonnet is made of dark brown velvet and lined with cotton. 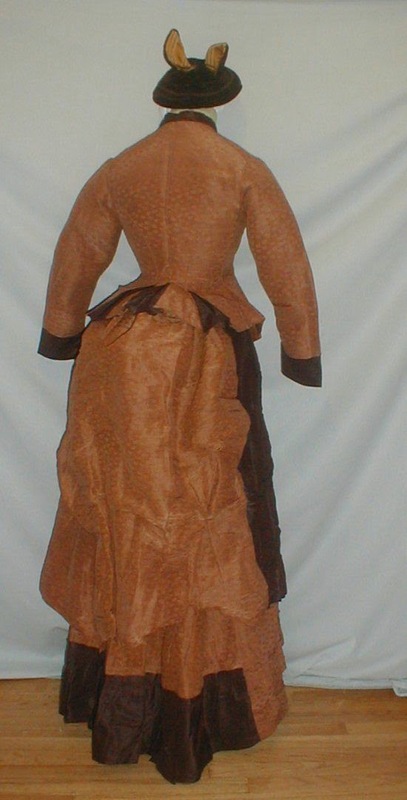 It is trimmed with brown silk cording. The ensemble is in very good condition. There is a thin line of underarm discoloration mostly to the inside lining. 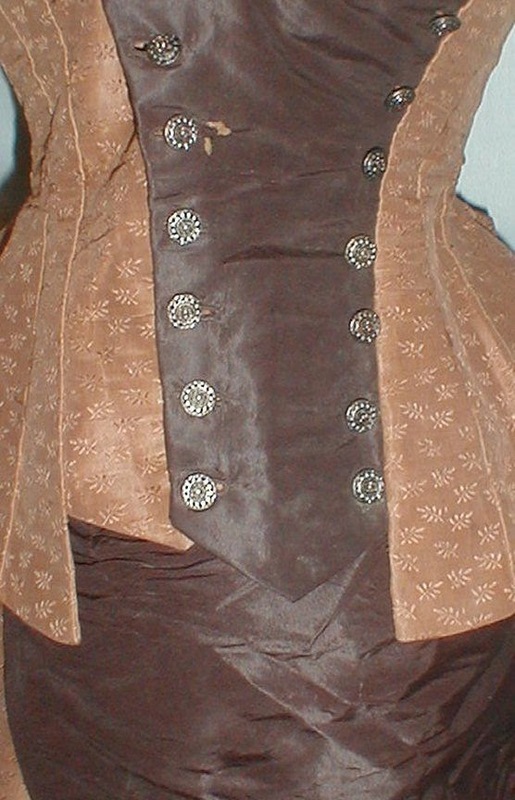 The buttons have been moved on the bodice and can be moved back into place. There are 4 missing buttons on the top of the bodice and one small surface only hole on the front placket. (See photo.) The bonnet is in very good condition. Bust 32 Waist 24 Skirt length 39. This looks dowdy to me. Maybe it's one the wrong form? It just looks like something an older lady would wear. Anyway, the sleeve and length of the bodice suggest 1870's. Definitely poorly displayed, poor thing. It's all slouched forward when it should be swept back with a gentle bustle slope. It looks exhausted. I think it may actually be a maternity dress. It may very well have been her wedding dress and then altered later. If the dress was altered a few years later when the dress was less stylish and no longer "Sunday's best," it would have been the perfect candidate for transforming into a maternity dress. The moved buttons and oddly-fitted bodice were probably from letting the dress out to accommodate her growing belly.